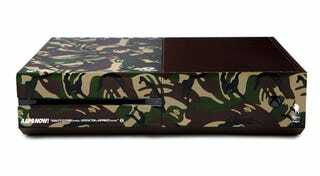 This special Xbox One / A Bathing Ape console, which I like very much, will sadly never be sold to the public. It was a piece of swag, used only as a "promotional gift" for an event in Hong Kong earlier this month. I mean, I guess it might turn up on eBay, but given the fact it's limited - and a Bathing Ape collabo at that - you wouldn't able able to afford it anyway. The console was accompanied by a camo controller, a plush version of the controller, a t-shirt and tote bag. It's not the first time BAPE have lent their name to a console; they teamed up with Nintendo a few years back for one of the best limited edition DS handhelds ever released.